Global information company The NPD Group says visits in the British out-of-home (OOH) or eat-out foodservice market will slide in 2019 and 2020. The market peaked at 11.35 billion visits in 2017 but dropped – 0.5% to 11.29 billion in 2018. Despite population growth of +0.6% per annum, there will be a further drop of -0.5% in 2019 and another -0.1% in 2020 to reach 11.23 billion visits. However, NPD is predicting a +5.0% increase in spend to £59.47 billion by end of 2020, against the £56.62 billion for 2018. This will be mainly driven by operators increasing menu prices as they respond to cost pressures, including inflation. The average individual cheque reached £5.00 in 2018 and will rise an additional 5.6% by 2020 to £5.30. 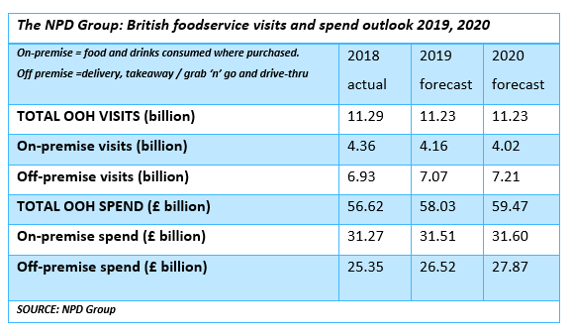 A key trend in British foodservice is the decline of the on-premise sector (food and drinks consumed where purchased) versus off-premise (delivery, takeaway / grab ‘n’ go and drive-thru). This is the result of the long-term decline in retail footfall as more shoppers purchase online. The on-premise market peaked at 4.58 billion visits in 2016 but dropped in the two years following. It will lose a further 8% by end 2020 (vs. 2018) to reach 4.02 billion visits. On-premise spend will increase marginally – but mainly as a result of operators increasing menu prices. NPD is predicting a better performance in the off-premise sector. NPD forecasts off-premise visits will reach 7.21bn visits by end 2020 (4% higher than 2018), while spend is forecast to jump +10% to £27.87 billion. Because takeaway and grab ‘n’ go currently contributes such a high percentage of off-premise visits (83%) even low growth makes a difference. NPD’s forecast is for takeaway and grab ‘n’ go visits to increase by 1.6% and spend to go up 6% by end 2020. NPD says the industry will also ramp up delivery and invest in drive-thru as an additional way of responding to the decline on the high street. NPD’s forecast is for consumers to spend 22% more on delivery by end 2020 to create a delivery market worth £5.8bn annually. The number of delivery visits will jump 17% by end 2020 to reach 882 million. The delivery market currently accounts for 13% of all off-premise foodservice visits but by end of 2020 delivery’s share will have increased to 15%. By 2020, delivery could comprise almost 10% of spend in the total British out-of-home (OOH) or eat-out foodservice market, piling additional pressure on operators that rely heavily on on-premise visits. Visits originating digitally – meaning customers using digital kiosks or order screens in a foodservice outlet, or ordering online or via apps for delivery or takeaway / grab ‘n’ go – will exceed 1 billion per year for the first time by end of 2020. The use of apps in particular is expected to continue to see a rapid increase in use, with visits that originate from an app (both click and collect and delivery apps) forecast to leap by 88% between now and the end of 2020. If app-based orders perform as predicted, they will have grown 2.5 times in visit terms since the end of 2017.